Posted by Nicole Richards on Wednesday, July 22nd, 2015 at 11:00am. This time of year in South Florida, locals are invited to get their zen on at the annual pamper fest known as Miami Spa Month, which actually lasts two months, July and August. 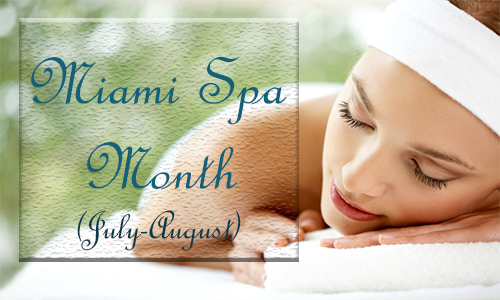 Miami Spa Month offers spa specials and discounted treatments at over 30 Miami-Dade world class spas. You may be avoiding South Florida’s heat, but skipping out on the summer month’s means you are missing out on the best times of the year for pamper fests like Miami Spa Month. What a better way to chill at a wonderful resort and get a special massage or facial while spending the rest of the day lounging poolside or enjoying other resort facilities. Indulge in the highest standards of pampering and rejuvenating special treatments for as low as $99. Some spa month pricing will have as much as a discount of 50 percent. There are numerous counts of wonderful and luxurious spas in Miami, Florida and all across town as these standout local wellness centers offers everything from Eastern cultural influences to state-of-the-art skincare technology! The summer sun and high temperatures in South Florida means it is time to relax, retreat and repair at Miami’s Luxury Spa and Wellness venues from July 1- August 31st. Where: Various luxury spas throughout Miami-Dade County.